Practice makes perfect. 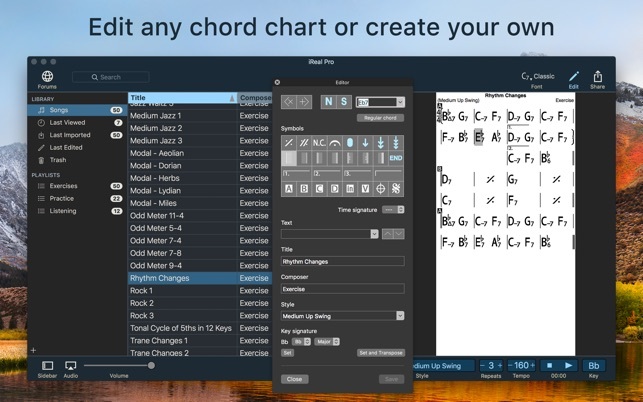 iReal Pro offers an easy-to-use tool to help musicians of all levels master their art. It simulates a real-sounding band that can accompany you as you practice. 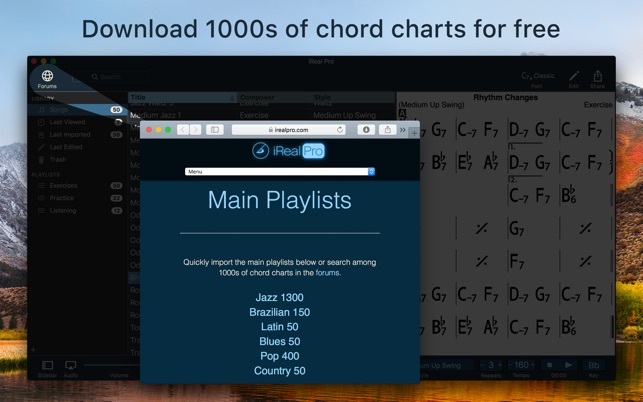 The app also lets you create and collect chord charts of your favorite songs for reference. 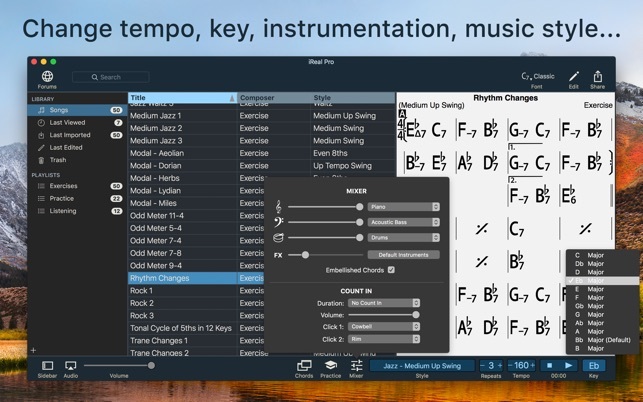 Used by thousands of music students, teachers and some of the world’s top music schools such as Berklee College of Music and Musicians Institute. 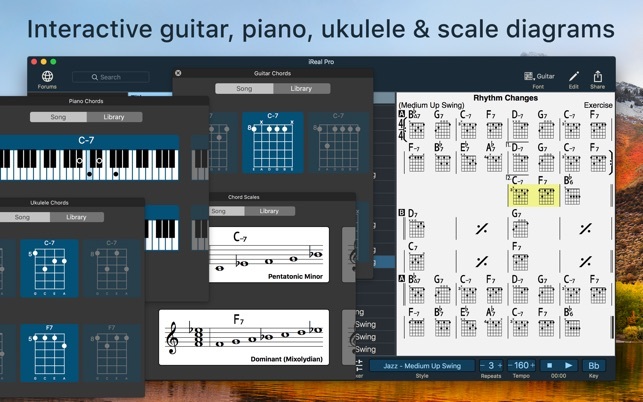 Practice with a realistic sounding piano (or guitar), bass and drum accompaniments for any downloaded or user-created chord chart. Share, print, and export – so your music follows you wherever you need it! Are you still having issues Bill? Please contact us directly if Apple hasn't been able to resolve the issue as it sounds like a problem with the Apple ID. As a long time Band-in-a-Box (BIAB) user, I was hesitant to switch over to iReal Pro but the convenience of using my iPhone as a practice tool instead of a computer at the piano (BIAB is PC only) won me over. Understand, iReal Pro is no BIAB. 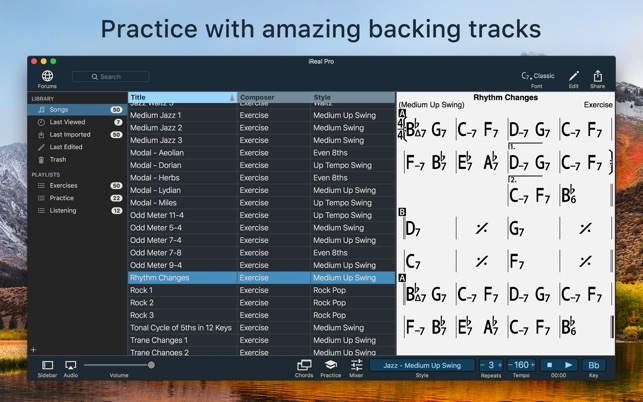 BIAB outputs phenomenally good audio quality and allows for extreme flexibility that is capable of creating musically sophisticated backing tracks that are indistinguishable from the real thing (actual musicians, which is what BIAB uses). It does not run on any mobile device, however, which is a fatal flaw these days. If iReal Pro can improve the audio quality, add sophistication to it’s arranging capabilities (and also a professional UI upgrade would help too) then they would own the play along app market. Sorry if I sound like I am being harsh but I really want see the developers of iReal Pro make this into a killer app. I’d be happy to pay for the upgrades as in-app purchases to keep the revenue flowing and the development ongoing. Niki is awesome- answered me on a holiday. 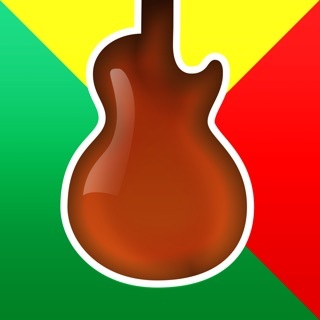 Please take this app to the next level! This is superb piece of software at an incredibly reasonable price. I use it daily. My improvisational skills have grown because of it. That’s not just my judgment. The people I play with want to know what I’m taking. I tell them iRealPro in daily doses. My interactions with customer support are among the best I have ever experienced. My contact is with someone called Niki. I don’t know if Niki is male, female or robot. But, boy, is Niki helpful! If you want to be a better player, I can think of no better place to start.